The Better Life 3-Person Healthy Living Carbon Corner Sauna was designed for ease of use. Assembly is quick and simple, taking less than 60 minutes. Simply plug the sauna into any dedicated 20 amp 120V outlet and don't worry about any special wiring. You can install it on carpet or in any indoor spot, including the basement, garage, master bath or walk-in closet. After you've assembled it, enjoy effortless operation with the convenience of a dual (interior and exterior) soft-touch control panel and LED display for controlling the temperature and time settings. The Poolmaster Swimming Pool Backwash Hose is made of quality extruded vinyl that holds up to extreme weather conditions, be it hot or cold. UV treated and resists fatigue due to the elements. Flexible and rolls flat for storage. 2-Person Hemlock Infrared Sauna with 5 Ceramic Heaters Radiant Saunas are the safe, effective and affordable way to relieve stress and improve health, right in the comfort of your own home. Radiant saunas utilize the latest in infrared heat technology and are super easy to assemble. With their Solid Hemlock Wood and tongue & grove buckle construction, these saunas are built to last, providing you with years of health benefits and stress relief. The 2-Person Infrared Sauna is perfect for relaxing and rejuvenating with your special someone. It will fit in virtually any room in the house. The dual interior and exterior LED control panels allow for easy temperature control. This sauna comes equipped with a magazine rack, 2 backrests, CD Player with mp3 plug-in, colour therapy light and an oxygen ionizer. The Sauna operates on a safe 120v/15-amp power and is backed by CETL certification. 5-Year Warranty on wood, structure, heating elements & electrical; 1-Year Warranty on radio. 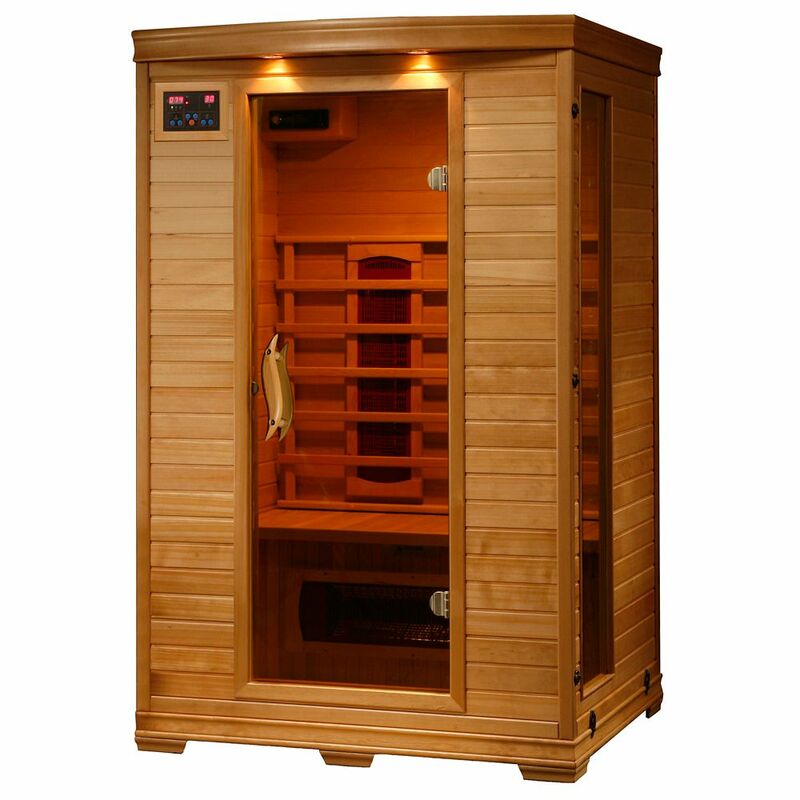 2-Person Hemlock Infrared Sauna with 5 Ceramic Heaters is rated 4.5 out of 5 by 11. Rated 4 out of 5 by Razer from Easy to use Love this sauna and the only thing that is a disappointment is the radio doesn't work very good. CD player is great though. Rated 4 out of 5 by Grasshopper from I have only had it a month and I love it. Wish it had cover for the side heaters. I have only had it a month and I love it. Wish it had cover for the side heaters. Rated 5 out of 5 by Mo from Really enjoy using this product. Really enjoy using this product. Rated 5 out of 5 by Donnica from We assembled it in 40 minutes. It's all I expected it to be. Thankful it came with the oxidizer... We assembled it in 40 minutes. It's all I expected it to be. Thankful it came with the oxidizer! Love the lighting, the radio, and the overall comfort of the sauna... Looking forward to many years of using it! My room is my sanctuary of peace, sauna and quiet!